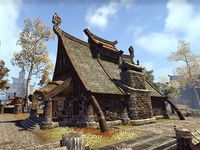 The Artisan's Hall is a smithy in western Riften, which houses several crafting stations and four vendors. It is an open-air Nordic-style longhouse located between the Marketplace and the docks. The smithy contains a cooking fire along with blacksmithing, clothing, and woodworking stations. There can be a safebox near the forge. Quite a few storage containers found here, including barrels, crates, sacks and produce baskets, are owned. The Ringing Anvil — A stall owned by the blacksmith Hadriss. Sand and Dust — A carpenter stall run by Strav Hlor. Steel Scales — A stall run by the clothier Scales-Like-Steel.